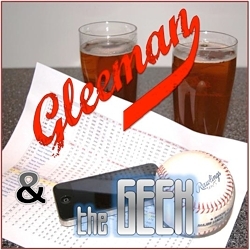 Today marks the fifth anniversary of this blog, which I started way back on August 1, 2002. The subject of my very first entry was the high pitch counts being racked up by A.J. Burnett. I wrote that I was "worried about his future" and added that "the way he's being treated makes me think he's in line for some arm troubles." As the subject of my debut blog entry, it's interesting that a look at Burnett's career since then shows just how much can change in five years. Burnett did end up with "arm troubles" soon after that, missing nearly all of the 2003 season following Tommy John elbow surgery. He bounced back strong enough to put together a 200-inning season in 2005, which earned him a five-year, $55 million contract from the Blue Jays the following winter. More arm troubles limited Burnett to just 21 starts in his first season in Toronto and after making just 15 starts this season he's been shut down again, this time with a shoulder injury. In the time I've been writing this blog, Burnett has blown out his elbow, returned to continue his career, signed a massive long-term contract with a new team in a new league, and is now injured again after a second team let him pile up a heavy workload. Oh, and he's also 30 years old, whereas the basis of my debut entry was that "there's just no way that a 25-year-old pitcher in his second full season in the majors should be allowed to consistently throw that many pitches, start after start after start." That initial entry about Burnett was written for an audience that literally didn't exist and it's entirely possible that it was read by zero people within the 24 hours after it was posted, which is another example of how much things can change in five years. Back then, I was an aspiring writer who had just finished his first year of college. I hadn't even been accepted into journalism school yet and had experienced just one of what would eventually become multiple rejections from the Minnesota Daily. And now? Well, I dropped out of school to become a full-time writer, recently purchased my first home, and can force the thousands of people who come to this blog every day to read about a five-year-old entry that no one saw at the time. And if all that doesn't convince you of how much things can change in five years, consider that my second ever blog entry was about David Ortiz winning AL Player of the Month honors after hitting .380/.462/.772 with eight homers ... for the Twins. Not only were things a whole lot different five years ago, plenty has changed since five days ago too. 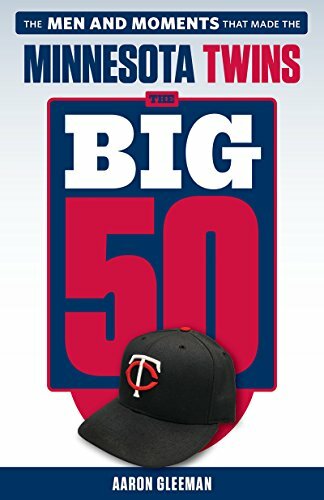 When I left for St. Louis to attend the 37th annual SABR convention last week, the Twins were losers of five straight games, Jason Tyner was homerless in 1,216 career at-bats for what was by far the longest active homerless streak in baseball, Luis Castillo was hobbling around the Metrodome, and Kevin Garnett was preparing for another miserable season with the Timberwolves. As you probably gathered from the overall theme of the pictures that I posted here yesterday, I tend to lose touch with current events during my yearly trek to the SABR convention. Checking my BlackBerry between drinks was basically my only source of news for 96 hours. In fact, I learned of Tyner's home run via an excited phone call that I received while in a bar Saturday afternoon, relaying the message to a group of equally stunned SABR members. Thanks in part to Tyner's first career homer, the Twins went into Cleveland and took two out of three games from the Indians, which seemed almost impossible when I last saw them getting swept by the Blue Jays. As if all that weren't more than enough for me to miss while in St. Louis, the surprising news kept rolling in after I arrived back in Minnesota on Sunday night following a miserable nine-hour stint in the St. Louis airport thanks to Northwest Airlines canceling my morning flight. My body spent Monday ridding itself of various intoxicants while trying to catch up on sleep. Once I woke up, I began working on a picture-filled write-up of the convention, which is a yearly tradition. As I did, news broke that the Twins had traded Castillo to the Mets for a pair of minor leaguers. A third-place team trading a pending free agent is certainly never beyond the realm of possibility, but prior to leaving I hadn't heard or seen a whole lot of talk suggesting that Castillo was likely to be dealt. If anything, I returned to Minnesota assuming that the Twins were in "buy" mode following the series win in Cleveland. In fact, part of the reason why I decided not to put the convention recap on hold in order to discuss the Castillo trade here yesterday is that Terry Ryan seemed likely to have several follow-up moves planned before the trading deadline. After all, whether they were buyers or sellers, why would the Twins stop at simply trading Castillo? As I tried to make sense of the Twins' plans while finishing my write-up of the convention, the news broke that the Timberwolves were on the verge of trading Garnett to the Celtics. Things weren't quite official as I posted my convention recap in the wee hours Monday night, so I decided that, much like with the Castillo trade, breaking down the Garnett deal could probably wait another day. Except now it's "another day" and ... well, I'm still not sure what to think. Not only does Tyner still have his homer, the Twins followed up their series win against the Indians with back-to-back victories over the Royals, and Ryan's moves did stop at simply trading Castillo. Beyond that, I watched Garnett hold up a Celtics jersey while being introduced to the Boston media yesterday afternoon. When it's mid-February and I'm desperately searching for something mildly interesting to write about, I'll remember the time when I left for 96 hours and all hell broke loose. Ryan's decision-making leading up to the trading deadline is a subject that figures to work its way into plenty of conversations down the stretch, so I'll hold off on a full-fledged analysis of the Castillo deal (and various non-deals) for now and instead focus on the Garnett trade. With the Timberwolves falling apart in recent years, it became popular to criticize Garnett for the things that he didn't do, while placing much of the blame for the team's struggles on his shoulders. That's unfortunate, because he's perhaps the greatest athlete in the history of Minnesota sports and would have left with a significantly different legacy had Kevin McHale and the Timberwolves been able to surround him with championship-caliber talent for more than a handful of his dozen seasons. 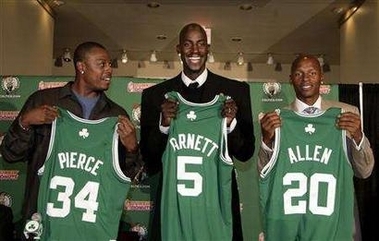 In fact, had McHale and company not failed so miserably at their jobs, Garnett wouldn't have left, period. Not for one moment was Garnett anything close to the Timberwolves' problem. Because of that, it was incredibly sad to see him holding up that Celtics jersey alongside Paul Pierce and Ray Allen yesterday. Garnett deserved better during his time in Minnesota and after watching his emotional press conference, I'm convinced that leaving was simply the last resort for a frustrated, beaten down man. As a Garnett fan who tired of McHale's team-wrecking tactics long ago, on some level I'm happy to see him in what has a chance to be a very good situation in Boston. It's almost impossible for a team to make a "good" trade while dealing away an inner-circle Hall of Famer in the prime of his career, and anything less than building a perennial contender around Garnett qualifies as a massive failure on the organization's part. With that said, given the fact that they failed miserably in building around him and then waited until their bargaining power disappeared before dealing him, the Timberwolves did relatively well to get the package they received in return. The centerpiece of the deal is clearly Al Jefferson, who at 22 years old is one of the NBA's best young players. While he'll never completely fill Garnett's gigantic shoes, Jefferson can immediately step into his spot in the lineup while taking over as the team's best player. A borderline All-Star while averaging 16 points and 11 rebounds last season, Jefferson has a chance to develop into one of the league's premiere big men and gives the Timberwolves a new star to build around. Jefferson is now the biggest piece in the Timberwolves' long-term puzzle, but the key to the trade may end up being Gerald Green. Along with Danny Granger, Green is a player I wanted the Timberwolves to draft with their first-round pick back in 2005 (they took Rashad McCants instead). At just 21 years old he's extremely raw and has a long way to go before becoming an impact player, but Green has a chance to become a big-time scorer to compliment Jefferson's inside presence. I have high hopes for both Jefferson and Green, which is why I think that McHale did reasonably well to build the package for Garnett around them. However, I'm far less enthused with the rest of the return. Like Jefferson and Green, Sebastian Telfair is a former high-school draftee, but he's regressed as a player while wearing out his welcome in both Portland and Boston thanks to lackluster play on the court and problems off it. Stephon Marbury's cousin and a "star" since junior high, Telfair is a lightning-quick point guard with outstanding ball-handling skills who hasn't shown that he can shoot or pass well enough to be an NBA-caliber starter. Of course, for all the disappointment associated with his career, Telfair turned 22 years old in June. In other words, there's still plenty of upside there and, like the 22-year-old Jefferson and 21-year-old Green, he's someone the Timberwolves could potentially build around for a long time. The fourth young player included in the trade is 24-year-old Ryan Gomes, who has far less long-term potential than Jefferson, Green, and Telfair. A second-round pick in 2005, Gomes is an undersized power forward in the Craig Smith mold who, like Smith with the Timberwolves, emerged as a solid role player for the Celtics while averaging a dozen points and six rebounds per game last season. He gives the team some much-needed frontcourt depth. Much is being made of the two first-round draft picks that the Timberwolves received along with Jefferson, Green, Telfair, Gomes, and Theo Ratliff, but the picks aren't as valuable as they initially appear. One pick is the Celtics' first rounder in 2009, but with Garnett in the fold they don't figure to be in the lottery again anytime soon. The other pick is one of the Timberwolves' future first rounders that was originally sent to the Celtics in the misguided Wally Szczerbiak-for-Ricky Davis trade. Unlike the Celtics, there's a very good chance that the Timberwolves will be back in the lottery. However, they couldn't have lost the pick to the Celtics until two years after they traded a future first-round pick to the Clippers (which hasn't happened yet) and the selection was "protected" anyway, which means that it likely wasn't going to be a top-five pick regardless of how horrible the team finished. In other words, not all "first-round picks" are created equal. Aside from Jefferson there's no sure-thing star in that group, but there's plenty of depth and long-term upside if the coaching staff can develop guys like Green, Telfair, Corey Brewer, and Randy Foye. Plus, I suppose it's possible that McHale could add another building block or two by dealing away some combination of Davis, Mark Blount, Juwon Howard, Trenton Hassell, and Marko Jaric, although I wouldn't count on it. I'm sad to see Garnett go and may never get over the fact that his prime was wasted by McHale, but for the first time in a long time there's some reason to be optimistic about the team's long-term outlook. The good news is that the Timberwolves suddenly have one of the NBA's better young cores. The bad news is that they're still several years and at least one major piece away from being contenders, and McHale is still the person in change of getting them there. Good luck in Boston, KG.